The traditions and recipes of Judaism are celebrated in this beautiful modern cookbook geared toward kids and their families. 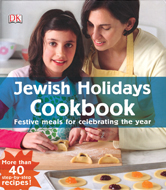 Eleven Jewish holidays are discussed and accompanied by recipes for the ancient and modern foods traditionally served. Kids can lead the charge on braiding their first challah or making their own kugel, while spending time learning about Jewish history and heritage. Jill Bloomfield is DK's resident kids' cooking expert. She is also the creator of a kids cooking consulting company, Picky Eaters. Originally a microbusiness that provided hands-on kids' cooking parties in clients' homes. Picky Eaters evolved as the "kids in the kitchen" trend caught fire (though, thankfully, her clients' kitchens did not). In addition to her work in the world of kids cooking, Jill also teaches English, public speaking, and Jewish culture classes in Rockville, MD.